Gripsweat - NICK DRAKE Five Leaves Left, Vinyl LP Album Original 1969 Issue. 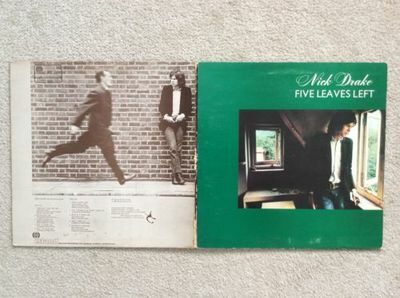 NICK DRAKE Five Leaves Left, Vinyl LP Album Original 1969 Issue. NICK DRAKE Five Leaves Left 1969 Vinyl Album. Sleeve has storage wear and scuffs as shown in photos. Side 1, track listing misprint (tracks 4 & 5 transposed). Vinyl has a long surface scratch across most of side 1 (see photo). This cannot be felt. Otherwise vinyl looks great. This is for sale from our personal collection. We are not dealers. It will be dispatched in a purpose made box.